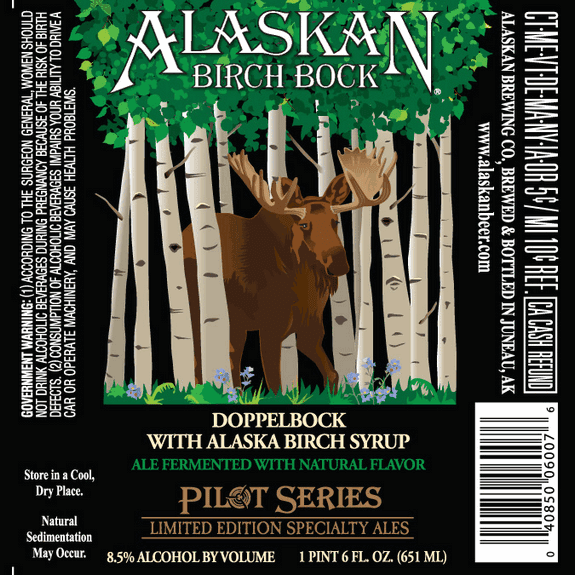 Juneau, Alaska (February 16, 2012) - Alaskan Brewing announces the release of Alaskan Birch Bock, the newest addition to their Pilot Series collection of limited edition specialty beers. This doppelbock-style ale brewed with Alaska birch syrup will be available on draft and in 22-ounce bottles in early March. 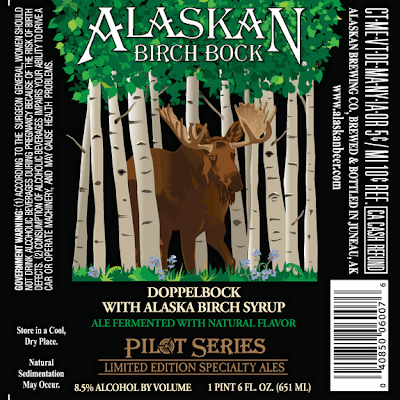 "Alaskan Birch Bock puts a unique twist on the doppelbock style," says Alaskan's Darin Jensen. "Birch syrup adds the perfect amount of sweetness mid-palate and a nice cutting dryness at the finish. We used over 45 gallons of syrup for the making so you can really taste it in the brew." The 2-3 week tapping window and time-consuming boiling process of Alaska birch syrup make it a truly rare and gourmet ingredient. The rich and spicy notes of birch syrup added complexity to Alaskan's 25th Anniversary Perseverance Russian Imperial Stout, but this distinct ingredient from the Alaska Birch Syrup Company and Kahiltna Birchworks is the showcase flavor in Alaskan Birch Bock. 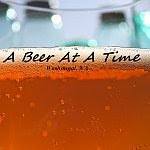 "Alaskan Birch Bock is a great addition to our collection of recipes that age well in a bottle," says Alaskan Operations Manager David Wilson. The natural tannins in birch syrup are akin to those of the spruce tips in Alaskan Winter Ale and of the smoke compounds in Alaskan Smoked Porter and Perseverance Imperial Stout. "The same compounds that preserved and protected the trees, now naturally preserve our beers." Other members of the specialty Pilot Series have included Alaskan's Double Black and Imperial IPAs, award-winning Barley Wine and Raspberry Wheat, which will make another appearance in the Pilot Series this June. 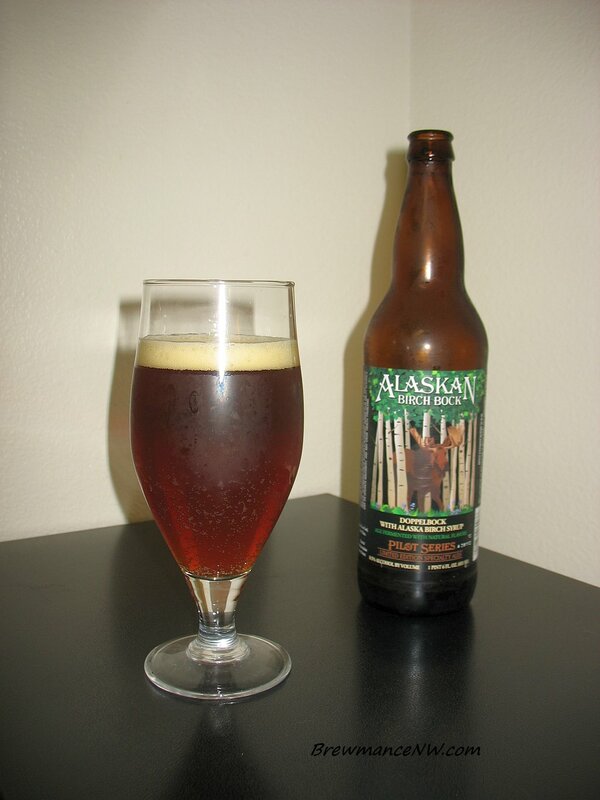 Alaskan Raspberry Wheat will be followed by the much-anticipated return of Alaskan Baltic Porter in September. - Pours a lightly cloudy mahogany brown. The brew has a nice reddish hue as well. Very minimal head.. leaves but a light dusting of off-white thin foam in the center, and a small ring around the edge. Pretty standard for the style. - A sweet floral and citrus grain bed aroma. Light maple, thick sugars, and an earthy approach with some esters. Tannins and a fruity touch for sure. Creamy oats and grains. Interesting. - A rather sweet brew with a fruity ester and tannin touch, light maple, and brown sugar. Grassy and earthy bitterness is light, but present. Little bready, but mainly just sweet. It's ok, but I can't say that I am blown away by this brew. - It's a chewy one, and slightly drying. The sweetness lends a little stickiness and a cloying attribute. It's well carbonated with a common yeast. - I love Alaskan Brewing, but have to say that this brew has 'average' written all over it. There certainly isn't anything wrong with the beer, but it doesn't stand out at all on all marks. I rate beers a 3.5 when they contain the quality I expect from a larger craft beer producer. A 3.0 can be found in a homebrew, but there would usually be something offsetting to get that. This beer doesn't have anything offsetting. It's just a little boring. Perhaps a big fan of the style would like to sit on a bottle awhile and let it oxidize. Not me.